Your smile can look as good as it feels with help from your cosmetic dentist in Atlanta, Dr. George Michaels. Families and friends turn to Midcity Dentistry’s menu of aesthetic services when they want to smile with full confidence. From porcelain veneers and Lumineers to metal free restorations and in-practice or at-home teeth whitening, we’ve got just the right solution for every patient. Learn more about our services and request an appointment today! Porcelain veneers and Lumineers cover up dental imperfections in one to two visits to the dentist’s office. These thin layers of dental porcelain are affixed to the front surface of the teeth that show when you smile. Traditional porcelain veneers are irreversible because they require the removal of a thin layer of tooth enamel before placement. Lumineers can usually be placed without modification to the healthy tooth enamel, so they can usually be placed in just one visit to the dentist. If you have a broken or seriously damaged tooth in the front of your smile, you need a solution that restores its strength and beauty. Metal free restorations take care of both. With a porcelain crown, bridge, inlay, or onlay, your dentist can repair the health of a damaged or decayed tooth without affecting the appearance of your smile. Metal-free restorations are completed over the course of two visits to the dentist, and they hold up very well against normal pressure (i.e. biting, chewing, and jaw clenching). Dental crown: Used to hold together pieces of a tooth, restore strength to weak or worn teeth, complete a root canal, restore dental implants, or make cosmetic improvements to a tooth. Dental bridge: Replaces one or more teeth missing in a row. Inlay/onlay: Fills cavity left by moderate levels of decay. 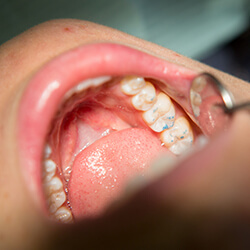 Solution between traditional filling and dental crown. 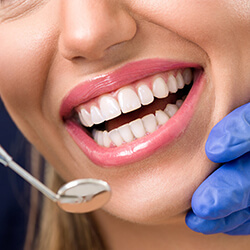 Teeth gradually get darker or yellower over time, and while there is no way to prevent discoloration from occurring, you can reverse the signs of age on your smile with a professional teeth whitening treatment. In-office Zoom! Whitening brightens teeth by up to eight shades in just one visit to our office. The powerful Zoom! treatment is effective for breaking through even the toughest stains, including those left behind by medications. For patients who prefer to whiten their teeth more gradually, or for people who are especially prone to tooth sensitivity, at-home whitening with Opalescence reveals whiter teeth over the course of about two weeks. The special formula is oxygenated to clean very deep, and customized trays hold the gel right up against your teeth for maximum whitening. Maintain good dental hygiene, stay away from the things that stain (coffee, tea, tobacco), apply periodic touch-ups, and you will enjoy your dazzling results for years.